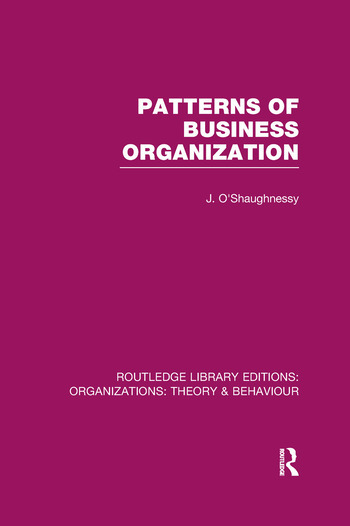 This book is a successor to the earlier and widely-used Business Organization. In this book the author helps the student to develop his or her own critical and conceptual understanding of the subject. As the author reviews the various approaches – classical, human relations, behavioural science, systems and contingency theories – he shows that none of them offers a simple progression from error to truth, but that all of them combine to contribute to a broader view of the field. The final chapter summarizes the author’s viewpoint, applying the different approaches to a particular case study. 1. Introduction. Part 1: The Classical Approach. 2. The Classical Approach – Introduction. 3. Grouping Into Sections, Departments and Higher Administrative Units. 4. Job Structuring. Part 2: The Human Relations and the Behavioural Science Approaches. 5. The Human Relations and the Behavioural Science Approaches: Introduction. 6. Individual Motivation and Group Behaviour. 7. Supervisory Leadership and Inter-Group Behaviour. 8. Organizational Groupings and Authority Distribution. 9. Role Delineation and Performance. Part 3: The Systems Approach. 10. Systems – Introduction. 11. Determining Information Needs. 12. Designing the Communication Channels For the Information Flow. Part 4: Contingency Theories of Organization. 13. Contingency Theories. Part 5: Organizational Change and Conclusion. 14. Organizational Change. 15. Conclusion. Appendix: Decision Schedule. Bibliography. Discussion Questions. Index.